"Texas is where Dixie ends and the Old West begins." 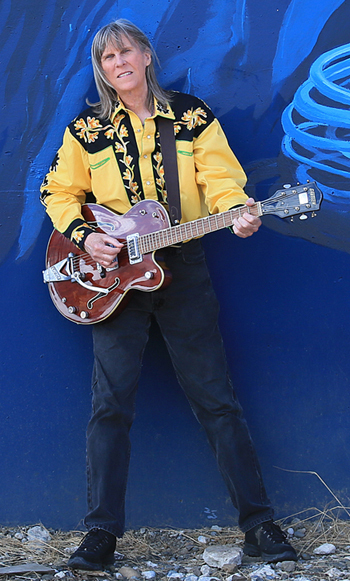 A fifth generation Texan, Rusty Reid was born in West Texas and raised on the same sun-burnt caliche that produced such stellar singer-songwriters as Buddy Holly, Roy Orbison, Larry Gatlin, Joe Ely, Guy Clark, Butch Hancock, Waylon Jennings, Jimmie Dale Gilmore, Amanda Shires, Delbert McClinton, Jon Dee Graham, among others. For an expanse of cactus and mesquite with more rattlesnakes than people, that's a pretty strong roster. Rusty moves in that tradition. Rusty's mom made sure there was always plenty of music in the home. Her side of the family was quite musical; it seemed everyone played an instrument and/or could belt a tune. She had a diverse record collection. In 1964, she came home from work with a new album with a strange title, "Meet the Beatles," later claiming it was the worst mistake of her life. As with so many American boys of that "British Invasion" era, Rusty's life was changed forever. "I wanna do that!" 11-year old Rusty proclaimed. After a few years of childhood piano lessons, having met the Beatles, Rusty switched to the guitar, first on a cheap Stella, then on a 1938 Gibson handed down from his singing cowboy uncle. It didn't take long for Rusty to want an electric guitar, the first being a Silvertone 1450 out of the Sears catalogue and a tiny Airline amp from Montgomery Ward. 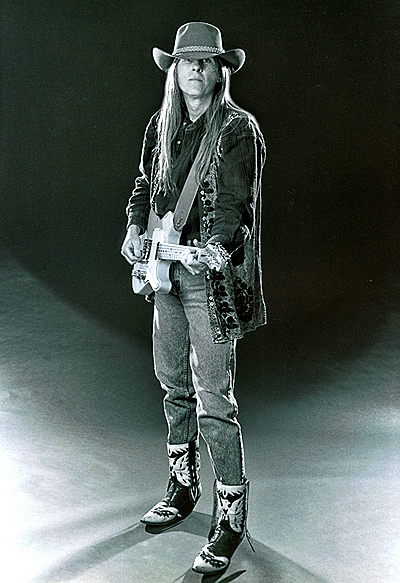 Rusty started writing original songs about the same time. That effort was helped along when he finally got a higher quality guitar, a 1968 Gibson Southern Jumbo acoustic. Like most other West Texas songwriters, Rusty dreamed of exchanging tumbleweed country for verdant landscapes, towns for big cities, wide open spaces for wider opportunities. After high school graduation, following an intermediate stop in Austin (which was not, at the time, the music hotspot it would soon become), he made a bee-line for the biggest city in Texas, Houston. He had left the Old West and gone to Dixie. A year and a half at the University of Houston proved daunting. Rusty's mind was on music, not studies, so after his third semester, with no particular concurrence from anyone else, Rusty decided he was ready for Nashville. In the cold winter of his 19th year, he packed up his '66 Chevelle with a change of clothes, stereo system, two guitars (the Gibson acoustic and an electric Gretsch Country Gentleman) and drove to Memphis, paying his respects to Beale Street and Graceland, then on to Music City. At first it seemed a charmed decision. 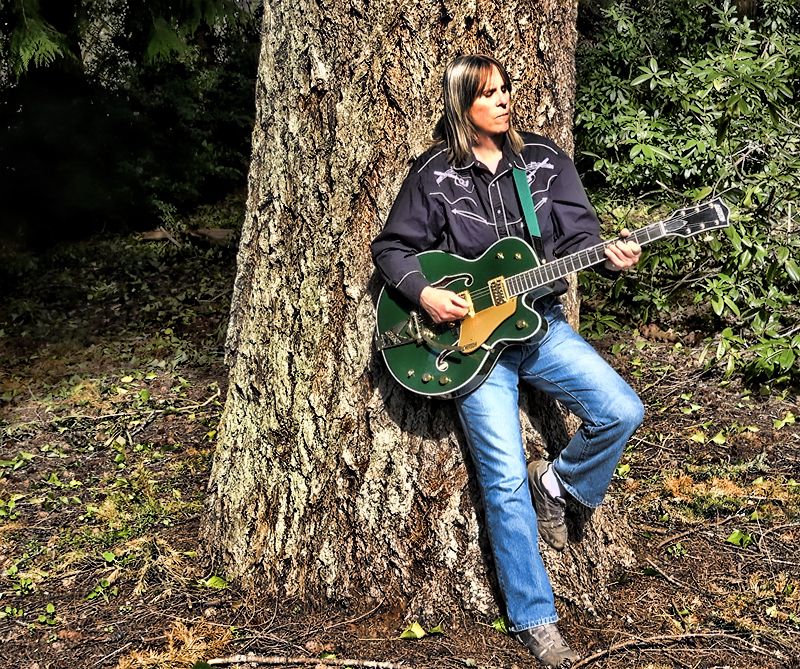 He met with famed guitarist Chet Atkins within hours of arrival, and found quick, initial success, signed as a staff songwriter for prestigious Peer-Southerm Music Publishing. Peer provided the opportunity of recording some of his songs in legendary RCA Studio B. "See, this is easy," he wrote home to his worried parents. But the fast start was ephemeral; it was a naive and premature move, though not without its experiential value. Anyway, that early material was sub-par, as well as too rock and pop influenced for the direction Nashville was enamored with at the time (this being before Nashville was as friendly with other genres as it is now). "Your style is more L.A.," became the consensus. 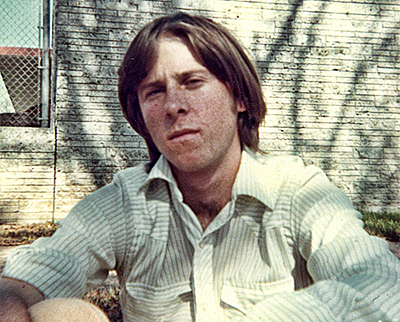 Nashville songwriter, 19 years old, 1972. So Rusty moved west, taking his catalogue of Studio B recordings to the Peer-Southern office in Tinsel Town. "This sounds like Nashville," the L.A. music honchos astutely complained, not offering any further advice or interest. Rusty bumped around the L.A. scene for a while longer, before heading back to college in Houston, eventually earning his B.A. degree. After college, Rusty put his degree in communications to work, making money working for the public relations departments of the Houston Hurricane professional soccer team, then with the Houston Oilers pro football organization, and by writing articles for local and regional publications. It was fun and exciting and sometimes, with the investigative journalism, was important work. But Rusty's mind was still on music. In Houston he played in several bands, and continued working on song crafting and finally, after a decade of practicing, came up with some numbers he still likes today. With not enough happening fast enough, musically, in Houston, Rusty heard the siren call of Los Angeles once again, and relocated in 1984, determined to not make the same mistakes this time around. He settled near the beach and got busy... not doing music. It turns out Rusty didn't make the same mistakes in L.A. the second time around; he made different mistakes. Whereas the first go-round found him putting in a stint working at a gas station, in L.A. Chapter Two, he landed what would surely be the typical American guy's dream job: writing and editing the company's sports publications for the largest magazine publisher on the West Coast, with the attendant requirement of having to attend the World Series and Super Bowl each year. Yep, somebody had to do it. It was a glorious state of affairs... for a while. Rusty's mind was not on music. 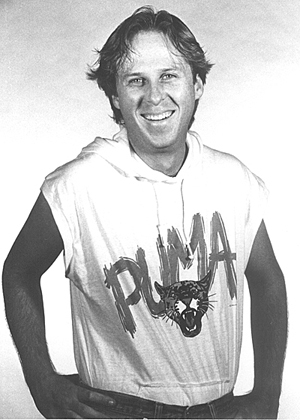 L.A. sports magazine writer/editor, 1987. With an office at the corner of La Cienega and Sunset, Rusty was within walking distance of any number of music publishers and record companies. He never darkened their door, always thinking the material he had wasn't quite good enough, he could do better, yet never actually finding the time to do better. It was easier to indulge in the storybook magazine career into which he had miraculously landed. Until the story became stale... which it quickly did. Soon Rusty became bored with it all... high profile events, bigtime sports stars, luxury hotels and all. While eating shrimp appetizers and sipping champagne at some sports ball at the Fontainebleau Hotel in Miami, Rusty recalls thinking, "This is not what I am supposed to be doing." His diminishing regard for his "dream" career in sports writing was reflected most visibly by his hair getting longer, a not so subtle freak flag flying in the face of his staid working milieu (this was prior to the players, themselves, embracing flowing locks and dreds). The only redeeming factor of the ongoing job was the travel, where Rusty soaked up the local flavors, history, geography and culture of sports venues from Hawaii to the Great Smoky Mountains. One trip eventually placed him at the third game of the 1989 World Series at Candlestick Park during the Loma Prieta earthquake. No serious journalist could retreat from that scene. As Rusty wandered and pondered the wrecked town over the next few days, two songs were inspired: "Earthquake City," and "Key to the City." Following the 1990 Super Bowl in New Orleans, Rusty took a leave of absence to go around the world in 50 days. Rusty bounced from LAX across the Pacific to Singapore, Kuala Lumpur, Bangkok, Kathmandu, New Delhi, Agra, Cairo, Luxor, Istanbul, Athens, Heraklion, Berlin, Prague, Copenhagen, Amsterdam, London and then across the Atlantic back to L.A. Ideas swirled as the scenery changed, natives of different cultures were embraced and once-in-a-lifetime experiences were compiled (such as watching the full moon rise over Cairo from atop one of the great pyramids, and singing in celebration of the imminent fall of the Soviet Union with a merry, drunken band of Czechs on the Charles Bridge in Prague). A new philosophy was emerging, and with it a new person. 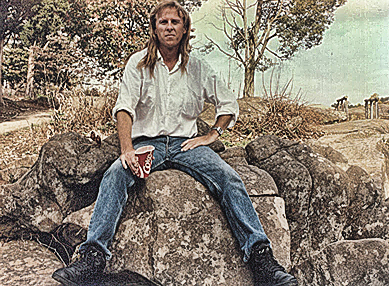 Rusty came back from that trip no longer a mere sports writer, songwriter, Texan, Californian or even American, but as an unabashed Earthling, a citizen of the world and strident defender of Mother Earth. It was time to get back to music, and finally do something. The clock was ticking and he had already long missed the sweet timeframe for any kind of pop music splash. At home in Manhattan Beach, Rusty assembled a studio to work with. A few good songs were written and recorded. 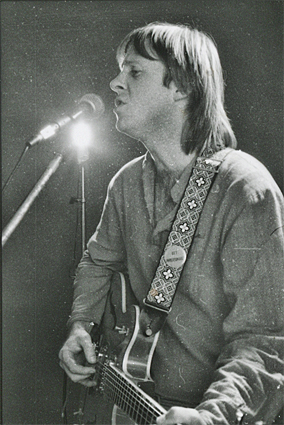 In accordance with his emergent worldview, the themes of Rusty's songs had taken a decided turn toward more substantive: a lot fewer silly love songs or personal songs of angst, more social commentary and musical activism. Bored with the sports business and with L.A. (can you imagine? ), Rusty wanted to be some place more organic, more real, some place with seasons. In 1995, after 11 years in Los Angeles, Rusty piled his belongings plus four goldfish, three chinchillas, and three parrots into a van, his Honda sedan towed behind, and made the 1,100 mile trip north up Interstate 5 to the Puget Sound. In the move, Rusty traded one "Earthquake City" for another, but also one music city for another. Rusty settled outside of town in an idyllic spot on the waterfront. It was a year or so after Grunge had died, nevertheless, the Seattle-Tacoma area remained a vibrant place for live and original music. The plan was to tap into that energy. As ever, distractions had other intentions. Just making a living was all consuming. The music would have to wait. And so it did until the dawn of the new millennium when Rusty released his first album, NWXSW (Northwest by Southwest). NWXSW Photo Shoot, Seattle, 2001. NWXSW was released a few months prior to the September 11, 2001 terrorist attacks. It promptly went nowhere. Only a few copies were ever sold. Certainly after 9/11, Americans were not interested in listening to a song claiming we are the barbarians. Three and a half months later, Rusty's father would pass away, this following the death of his grandmother a year before. "All told it was a load of bricks," Rusty says. "I felt stunned, stymied. I just wanted to crawl into a hole. I dropped the ball on the album, never listed it on iTunes or Amazon, which were both newly minted online music sales venues. There was no Spotify or Pandora back then. I never even considered getting a band together to promote it, or even go out solo. It all just seemed useless, hopeless. I would be turning 50 soon. I had to face the facts. I had missed my shot." Nearly 13 years would pass before Rusty finally regained his musical footing, switching from analog to digital recording, and setting his songwriting skills to the challenge of capturing the ideas that had been swirling in his head since the world trip. Songs began flowing in early 2014, and recording in earnest of his next album, to be titled Head to Heart began in 2015. Head to Heart Photo Shoot, 2018. Computer and internet-based technolgy connected Rusty to far-flung musicians who could collaborate through the digital medium to flesh out the new batch of songs. And a few old ones. Several of the hardest-hitting songs on Head to Heart date back more than two decades to Manhattan Beach and Hawthorne, California, liberated from the vault to join their new siblings. Rusty was championing women's rights, ripping on religion, and angered by gross social and economic injustice and inequality long before #MeToo, the New Atheists, Black Lives Matter, Occupy and the new Democratic Socialists began to lubricate the gears of change in more recent years. In 2019, Head to Heart is released, accompanied by videos for "Eldorado," "Dismaland," and "Too Many Poor." The album is a nothing less than a revolutionary manifesto in song. Rusty is now in his sixties. Imagine that! But he is still in reasonably good shape for an authentic child of the 60s, one who never lost the idealism and revolutionary spirit that decade is remembered for. Indeed, the Spirit of 1967, not to mention 1776, still lives in this eco-evo-revo spiritual philosopher of a songwriter. "I don't know what will happen with this album," Rusty says of any unlikely success at this age. "At any rate I did all of this for me. Any artist has to do their art, first and foremost, for themself, and that should be enough. If others like it or are moved or inspired or informed or provoked or disturbed by it, that's interesting; any financial gain is a plus. But if you are an honest artist, you know better than anyone if you succeeded or failed or hit somewhere in between. And even if you judge the project a failure, you still learn something through the process and, hopefully, get better. In the end, my art project has been myself. That's actually true for everyone. I'm still trying to get that project right. These songs are just my bangles." Rusty has written over 200 "bangles" to date. This is part of the story. There is much more. But that's a different tale for a different time.